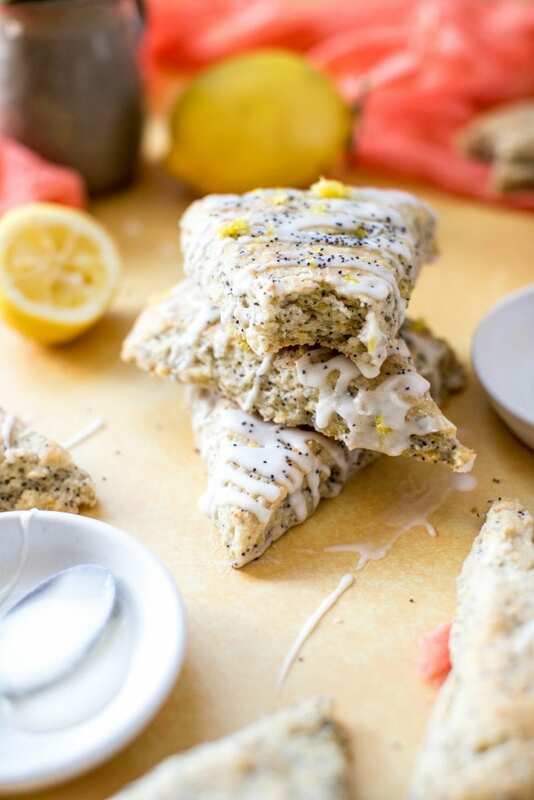 When life gives you lemons…you make Lemon Poppy Seed Scones Greek Yogurt Scones. Do you ever just get in a total baking mood? Wait, that’s me like, every weekend. My mom has a lemon tree in her backyard that has been producing lemons like crazy and she will call me over to pick up lemons from time to time. 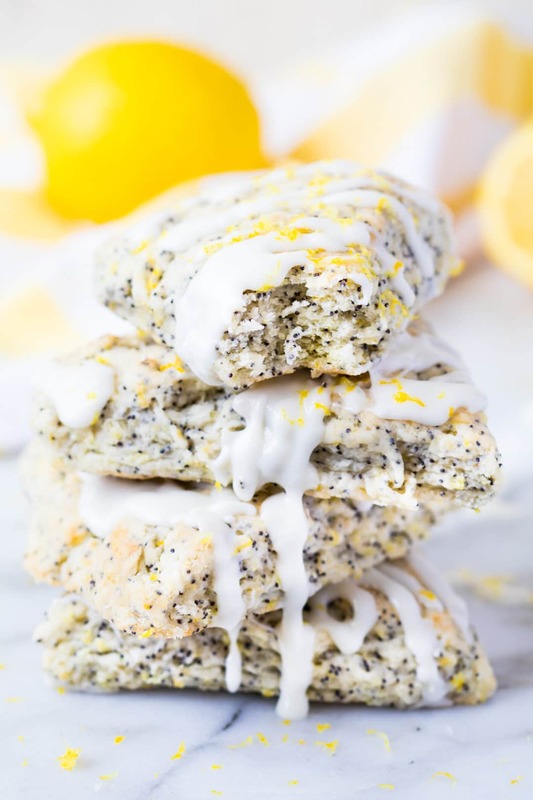 Life literally handed me lemons and said, “Hey Tawnie, make something!” So with lemon overload, and 3 full poppy seed jars I found on the spice rack…I decided to make some lemon poppyseed scones! I love scones. Not the ones that are dry and crumbly. But ones that have a moist texture and go perfectly with a cup of coffee in the morning. OR with a cup of tea post dinner, I’ll take both! I was so pleased with how this batch came out, and I give credit to the Greek yogurt. A lot of recipes use sour cream but I opt for the Greek yogurt for extra nutrients and less fat. (If you only have sour cream, it’s a fine substitute). 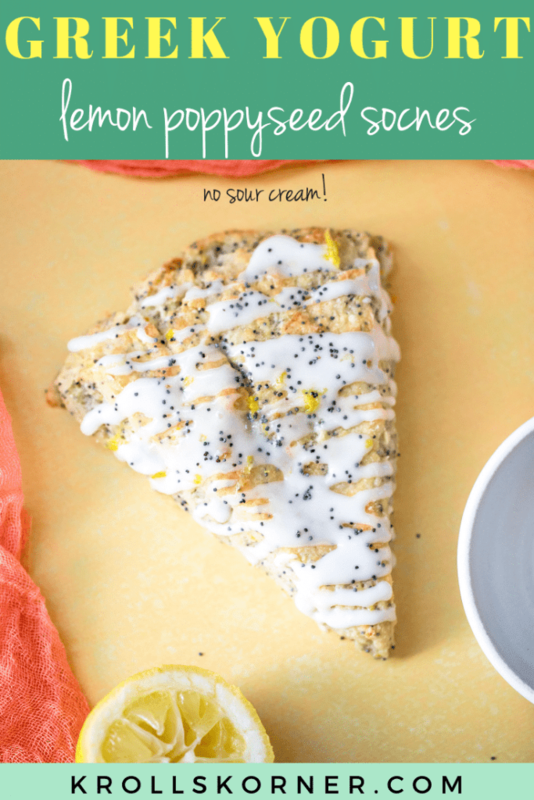 The only Lemon Poppy Seed Scone recipe you'll ever need. Preheat oven to 400 degrees F. In a stand mixer bowl, combine the flour, sugar, poppy seeds, lemon zest, baking powder, baking soda, and salt. Gently whisk or stir ingredients together. Add the chopped butter pieces and using your hands, mix until nicely incorporated. Place the stand mixer bowl now on the stand mixer and add in the Greek yogurt and 1/4 cup lemon juice on medium speed. The dough will come together and shape into a ball. Dump out the dough onto a piece of plastic wrap sprinkled with flour. Make sure to use flour so the dough does not stick. With your hands or a rolling pin, shape the dough into an large circle ~1 inch thick. Cut in half long ways, and the cut again crossways, and make each section into triangles. It should make 6 scones. Carefully place onto cookie sheet lined with parchment paper. Bake for 14-16 minutes 400 degrees F.
While scones cool, make the frosting. Stir together a tablespoon of lemon juice, melted butter, and powdered sugar until smooth. 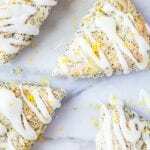 Drizzle over scones once they have completely cooled and garnish with lemon zest! Store the scones in a plastic baggie in the fridge, or air tight container. Heat in microwave for ~30 seconds and enjoy!! What is your favorite lemon flavored dessert or pastry item? I’d love to know! Leave me a comment below! YUM! A bad scone can be so bad, but a good scone is oh so good. Tawnie, these look GREAT! Can you just come live with me already so i always have delicious healthy things around the house?! Keep up the good work Tawn…definitely one of my favorite blogs to visit! Aw thank you SO much!! That means a lot to me!! These look delicious! 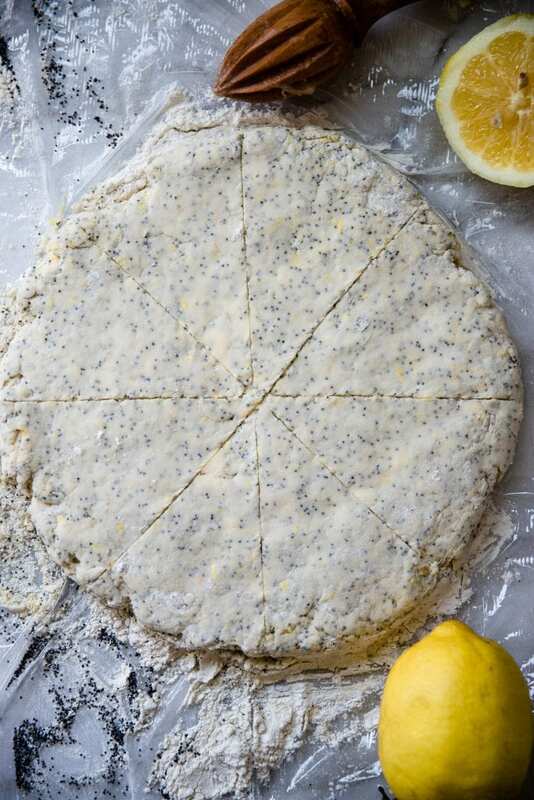 I adore lemon poppyseed and never seem to have that flavor enough. There’s nothing like a bad scone – yuck! These look delicious! I have actually never made scones before – perhaps these will by my first! Yum those look so good! I love lemon so much! These look perfect Tawnie! 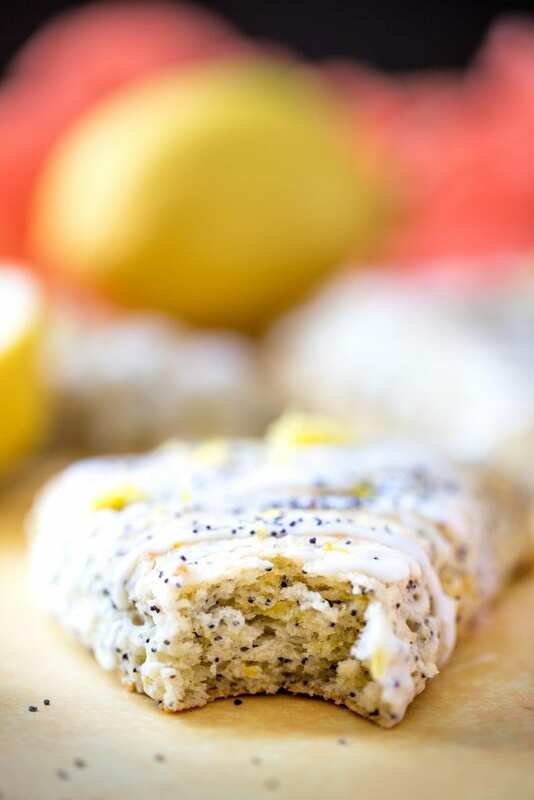 I love the bit of crunchiness poppy seeds add… and they’re so delicious with lemon! Catherine thank you so much! They were perfect for breakfast or dessert all last week! hehe. These were delicious! A perfect scone and really easy! Not dry at all! I’ve never made scones, but looks like I might have to try! You will make them with ease I’m sure of it!! 🙂 Hope you love them! So perfect for this time of year. Shared! Thank you Elissa! 🙂 Enjoy! yum!!! I love lemon in baked goods so much and I adore scones. These look fab!